With some startup money from the late Heath Ledger this group cut an album and put together a live show that is very different then what we have seen in a very long time. Ebert looks like Jesus reincarnate with his big burly beard and long hair. The band is quite large for the small room at DC9 with a total of 7 people on stage. Ebert had a lot of dialogue with the crowd and seemed he was trying to forge a bond with us. He spoke a lot about love and at one point told the crowd to hug the person next to them. It was a very joyous vibe at DC9 and for a little while it was like we were at a commune and Ebert was leading the band we were watching together as a family. Ebert was defiantly channeling energies on stage through certain songs as you could see the brooding intensity come through. Jade Castrinos does some singing of her own and she has an amazing set of pipes. Castrinos has an energetic fluidity to the way she moves on stage that is very difficult to describe in words. Castrinos and Ebert stare into each other’s eyes during some of the duets and tell each other they love each other on stage. Ebert’s informal way was a different approach then most bands saying stuff to the crowd such as “sshhh guys I love you.” Or “I still feel like its awkward between us.” This traveling troupe is spirited and fun and below is a clip to give you an idea of what the show is like. 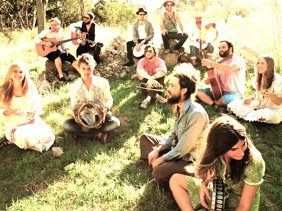 Edward Sharpe and the Magnetic Zeros are also in the process of making a feature length film consisting of a music video for each of their songs. The storyline follows a boy named Edward Sharpe who was immaculately conceived and has to wait nearly two years before he grows arms and legs. The first installment was filmed at Joshua Tree. Thought it was a good show last night. Yes, DC9 was packed and I overheard the band members' surprise as they walked on stage. Would love to see these guys play at a festival as their music invokes heavy-stepped frolic dancing. DC crowds are notoriously lame. No matter what the music was like, it's impressive he got some interaction out of them.